The purpose of cutting tool is the controlled removal of metal or material from the workpiece. A cutting tool exerts a compressive force on the material to be cut, which stresses the material beyond its yield point. Plastically deformed metal then shear off. The localized places where the plastic flow takes place known as a shear plane. Example: saw, broaches, drill bit, fly cutter, etc. The sharpness of tools also has an influence on efficiency. The sharp edges help to minimize the friction contact between the tool and workpiece. 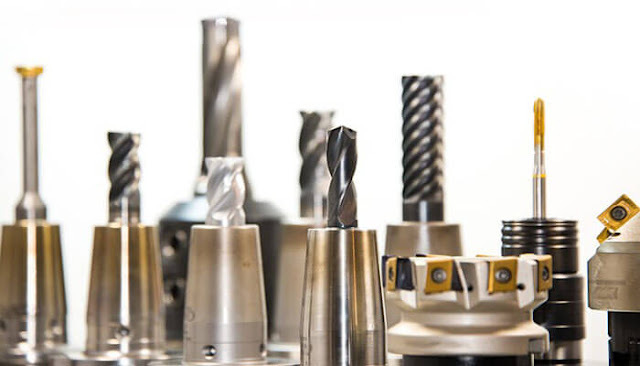 During machining, cutting tool undergoes very high forces and temperature gradient. Therefore, tool materials should be selected carefully. Single point tool - Have one active cutting edge; used in planning, shaping, turning, etc. Multipoint tool - Multiple active cutting edges - used in milling, drilling, etc. Rotary tools – Example: drills, milling cutter, reamers, countersink, etc. They further classified based on geometry, material and clamping method.